For the last two months, I have struggled to explain to my family the amount of water vapour present in the house. We would have liked to kill dust mites in the house and for this, the level of relative humidity (RH) should be maintained at less than 45%. But what does relative humidity of less than 45% mean? Searching many online resources, one could eventually find that it refers to a room temperature of 20°C. And that is where the subject becomes confusing for the general public - for the same amount of water vapour in the air, RH is different at different temperatures. In this blog, I shall go over the physics of humidity and discuss the importance of maintaining RH in the correct range (45 - 55%). The physics is thankfully quite straightforward. The main constituents of air in a house are nitrogen, oxygen and water vapour. The pressure of air is measured in millimeters of mercury or torr and for our purpose we can take it be fixed at 760 torr. Most of the 760 torr is due to the amount of nitrogen and oxygen present in the air. At normal room temperatures, water vapour contributes only a small amount - called the partial pressure due to water vapour. If we boil a kettle full of water then more water vapour will enter the surroundings; partial pressure of water and hence the humidity will increase. However, at any given temperature the air can only hold so much water vapour - it gets saturated - and any extra input of water (say boiling off from a kettle) will simply precipitate out and condense on the coldest surface in the room. So - at any temperature, it is only possible to have a maximum value of the vapour pressure of water - maximum humidity - or as we say - the relative humidity is 100% at that temperature. Notice that these values are much smaller than 760 torr. At normal room temperatures the maximum amount of water that air can hold is not that much. 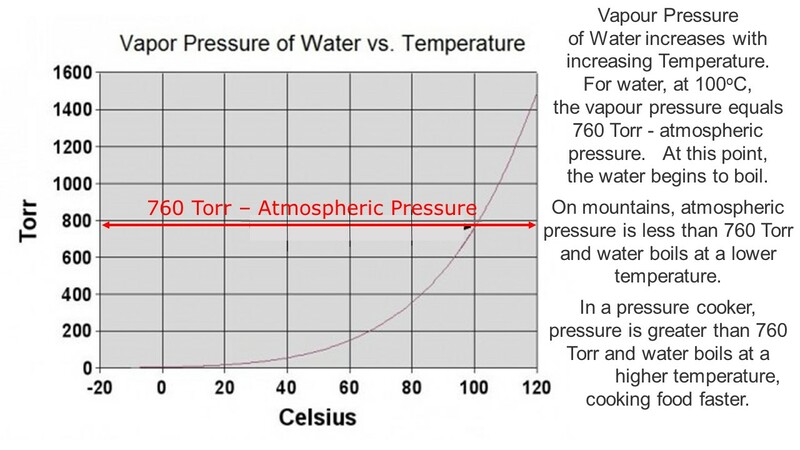 At T = 20°C , WVP is 17.5 torr - this is the maximum amount of water that the air at 20°C can hold and relative humidity (RH) is 100%. If the WVP is reduced to half this value, then the amount of water in the air is also halved and we say that RH is 50% at 20°C. Consider the situation: Outside temperature is 8°C and the air is quite damp - WVP or RH outside is 100% or 8.1 torr (see table). If we open the windows wide and let the air in the room be replaced by the colder outside air, then RH in the room (assuming it stays at 20°C) will be reduced to 8.1/17.5 = 46.3%. If the room temperature has dropped to 16°C then RH = 8.1/13.6 or 59.6%. The value of RH depends on both the amount of water in the air and the temperature. Mass of water in the room: Consider the contents of air at 760 torr. 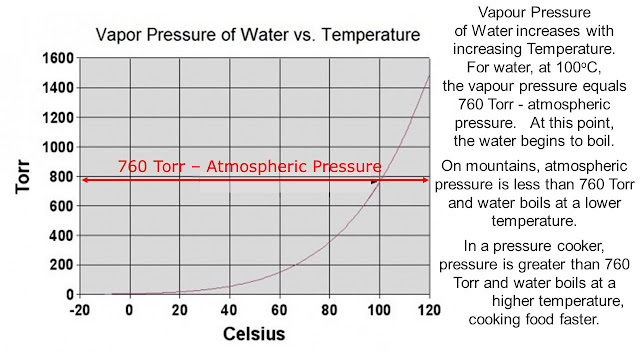 The WVP is 17.5 torr - remaining 760 - 17.5 = 742.5 torr is due to other constituents of air (mostly nitrogen and oxygen). There is a law in physics that states that the weight of 22.4 litres of a gas is equal to its gram molecular weight at 760 torr and 0°C. We shall use this law at other temperatures too - it is accurate enough for our purpose. The gram molecular weight of water is 18 gram while for air it is approximately 29 gram. For RH of 45%; Amount of water is 6.6 g/kg. A level lower than 6.6 g/kg is the recommended level of water content at 20°C to kill dust mites. I have highlighted in red the 'recommended' value of RH at different temperatures. Water content of 6.6 g/kg is easy to achieve for room temperatures of 20°C or less. At higher room temperatures, common in the summer and in tropical climates, RH will have to be less than 30% to kill dust mites. Interestingly, water content levels of 6 to 8 g/kg are recommended for healthy living. These levels are also suitable for dust mites, many fungii and molds to reproduce and grow. To complete our discussion, let us calculate the amount of water in a normal size room - say 5m x 4m x 2.5m or 50 m^3. An average size of room contains, at 20°C, about 400 gram or 0.4 litres of water at RH of 45% or about 8 cc water per m^3. This is not a lot of water. We can increase RH in a room by boiling some water in a pan or electric kettle. As a rough guide, 0.1 litre water, when boiled off, will increase humidity by 10% in a 50 m^3 space at 20°C. How is humidity measured: It is common to use a digital hygrometer which displays the temperature and relative humidity of the surrounding air. A hygrometer calculates the humidity by measuring the capacitance or resistance of the element. A capacitor has two metal plates with air in between them, It is used to store electric charge - its capacity to store charge is affected by the amount of water vapour between the metal plates. Measurement of the capacity provides an accurate value of the humidity. A resistive sensor is generally a piece of ceramic that is exposed to surrounding air. The humidity of the air in the ceramic resistor affects its resistance and hence the current flowing in it when connected to a battery. Low Humidity: In winter months, it is quite likely that the water content in your house will be less than 7 g/kg; with good ventillation, it could quite easily drop to 4 or 5 g/kg. Remember, it is the water content that is meaningful, relative humidity numbers depend on room temperature and are less useful. The low humidity air can lead to dry skin, itchy/dry eyes, irritated sinuses and throat. A hygrometer is the best way of monitoring humidity in the house, but tell-tale sign of houseplants drying out, wallpaper peeling at the edges or static electricity point to low humidity conditions. Exposure to low humidity can dry out and inflame the mucous membrane lining of the respiratory tract increasing risk of infections like cold and flu. In low humidity environment some viruses may be able to survive longer, further increasing the risk of infection. High HUMIDITY interferes with THE BODY'S Cooling Mechanism: Human body works best when the core temperature is 37°C. When outside temperatures approach 37°C, the body’s thermal regulation system attempts to cool it by transporting heat from the core organs by increasing blood circulation to the skin and sweating. Sweating, one of the main cooling mechanisms of the body, works by evaporating water that is excreted through the skin. This is where humidity becomes important. The concentration of water in the air (humidity) determines the rate at which water can evaporate from the skin. When the humidity in the air is high, it is not able to absorb the extra moisture from the sweat. The result is that sweating, instead of giving any relief, makes us feel hot and sticky. High humidity makes us feel hotter, more uncomfortable and unable to lose heat our core temperature actually begins to rise. The body compensates by working harder to cool us down. The loss of water, salt and chemicals can lead to dehydration and chemical imbalances within the body leading to heat exhaustion. 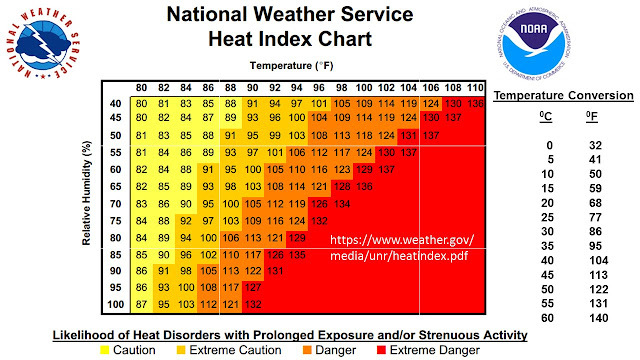 The heat index chart tells us quantitatively that in high humidity conditions the body feels hotter than the actual ambient temperature. For example, for an ambient temperature of 104°F (40°C) and a relative humidity of 40%, the water content in air is about 20 g/kg and it will feel like 119°F (48°C). But if the relative humidity increases to 55% (water content = 27 g/kg) the temperature will feel like 137°F (58°C)! Final Word: Mean global temperatures have risen over the past 100 years and are expected to rise in coming decades - mainly due to human activities. The combination of higher temperatures (> 38C) and higher humidity can be dangerous and will result in increased number of fatalities. Detailed sturdies have quantified such risks and identified regions of the Earth where high humidity and temeperatures will make life intolerable and survival difficult.